Janine and I have just enjoyed our first house concert of the year. We spent an afternoon with Lindsay Martin and Victoria Vigenser – again! We had them here with us in our home last year and they were terrific, such beautiful music. Lindsay is an amazing fiddler. They work together so well. A wonderful afternoon well spent. We are starting to eat into our summer preserves. We have been enjoying sliced peaches, plums and pears recently. We have just started to open our jars of preserved whole peaches. These were bottled in December and vacuum sealed into ‘Fowlers’ jars. Having been heated in a light syrup to seal the vacuum in the jars, then stored for 4 months in the pantry. These whole peaches are just starting to develop that wonderful marzipan flavour that they get from the stones. We have also been cooking a few cakes to keep the colder weather at bay on dull days. Janine used our pears to make a flan. She recalled reading the recipe in a book from many, many years ago. We had to go looking, but we found the book eventually, just where we though that it ought to be. I skimmed past it initially, as the cover wasn’t like I remembered it. Larger-than-life home cook, turned TV presenter, Ian Parmenter used to present a 5 minute cooking program as a fill-in on the ABC TV, possibly in the 80’s or 90’s? Called Consuming Passions Consuming Passionsand he later wrote a book called ‘Sheer Bottled Bliss’. Janine remembered his recipe for pear and almond up-side-down tart. It was very nice as I remembered it and just as nice this time round. Page 143, if you are interested. I tried my hand at prune and almond flan that I saw Rick Stein make on the Idiot Box one evening when he was in the Dordogne region of France. It look easy and I thought that I’d have a go at it. What could go wrong? Ididn’t have all the ingredients, but what the hell, give it a go. Soak a couple of cups of your prunes in brandy. I didn’t have enough brandy, so I used half Cointreau. I think that It might even be an improvement! Mix one of your beaten free-range eggs with the drained brandy. Then add in a cup of almond meal and half a cup of sugar. More or less. I liked it so much, I made another one. As the days get shorter and the evenings cooler, we are lighting the wood fired kitchen stove most nights now. This old stove, that I have lovingly maintained and repaired for the past 40 or so years, cooks our food, heats our hot water, through its bronze firebox boiler, which is connected to our kitchen hot water system. It also heats the kitchen and us while we work, cook and eat. In the hottest couple of months of summer, we cook on the gas stove and rely on the solar hot water panels to heat the hot water. We have had to cover the solar panels with wire mesh, as we had a pine cone drop onto one of them shattering the tempered glass. It may seem strange that we have our solar panels on the ground. I have a good reason. We have a full copper hot water system, with a copper hotter tank, a bronze boiler in the stove and copper solar panels, all connected in series, so that either or both heat sources can heat the tank depending on the weather and time of year. I used all silver soldered copper piping to connect the system, so there isn’t a separate heat exchanger needed in the system to eliminate electrolysis. A full copper system has no electrolysis issues. Eliminating the heat exchanger makes the system much more efficient. I designed the system so that the solar panels are on the ground, so that the hot water will rise up into the tank by natural thermo-siphon. No pump is need in the system to circulate the hot water to the tank. (as is necessary when the panels are on the roof.) This is another added efficiency and saving on energy. By designing systems like this and others in our hand-made home, we have managed to reduce our energy usage in our home to 1.7 kW/hrs per day for the house alone. If we add in charging the electric car and firing the electric kiln from the solar system, then our total usage rises up to 5.7 kW/hrs per day. When we add in our kiln and car, Janine and I still use only half of what a ‘normal’ single occupant household uses. Or just one-third of a ‘normal’ 2 person household. We are quite pleased with this outcome. We have reached the point where the tomatoes have lost most of their leaves. There are still loads of fruit on the vines. But the vines are looking pretty much dead. We pick all the remaining fruit for the last batch of concentrated tomato passata sauce. We have over twenty jars of the stuff from this years harvest, safely stored away in the pantry cupboard. We pull out all the vines and compost them and remove the stakes. We pull out all the weeds. The beds are then ready for a load of compost and a new planting. There are a basket of capsicums and chillies to harvest as well. I decide to roast them and pickle them to preserve them. They are sweated, peeled, de-seeded and then dressed with oil and vinegar. They will keep for a few weeks in the fridge treated like this. We have only just finished the last batch of capsicums that I preserved in this way a week or so ago. This is all standard autumn fare. A month ago we had a hail storm. Not too bad as hail storms go, but bad enough. There wasn’t a lot of rain with it, – a pity. A few weeks later we had a lot of rain in an hour. Quite a storm all told. We found to our surprise that we had a number of leaks appear in our old school classroom. We had to find buckets for the drips on the carpet, the computer table and other various places around the house. Having drips of water dropping onto the carpet in what is our lounge room, really concentrates your attention. I’m fixing a hole where the rain gets in and stops my mind from wandering! We don’t usually have leaks like this, so I had to investigate. However, I needed to wait for it to stop raining, then to stop blowing, waiting for a day when there was no gusty wind. I once went up on the roof on a windy day and the ladder blew away, leaving me stranded up there until Janine came looking for me, replaced the ladder and let me come down. She must love me! I finally found a day that wasn’t too windy, glarey or wet and slippery. I got up onto the top roof of the old classroom of the school. 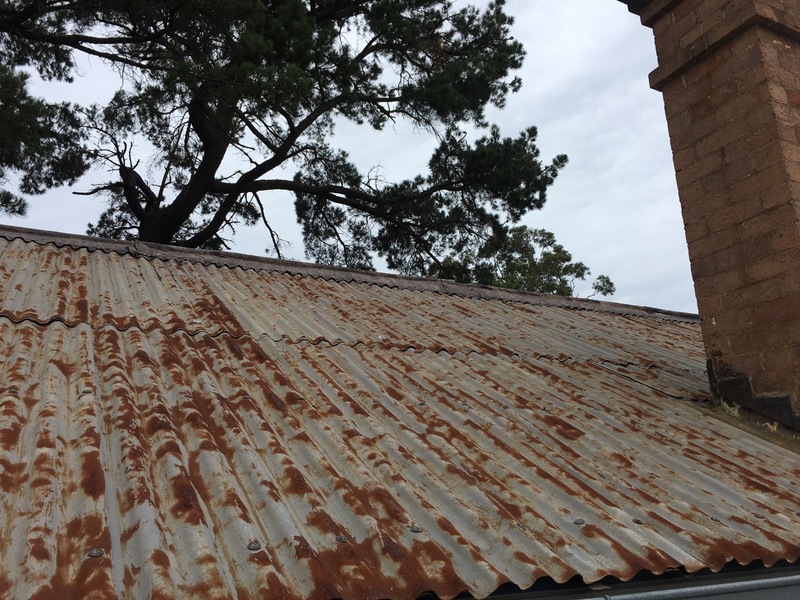 I found that the hail storm had pummelled the 130 year old corrugated galvanised iron roofing. Where there was an over-lap of the old sheets the iron had rusted to a very thin state because of the condensation in the over-lap, creating a few quite large holes. 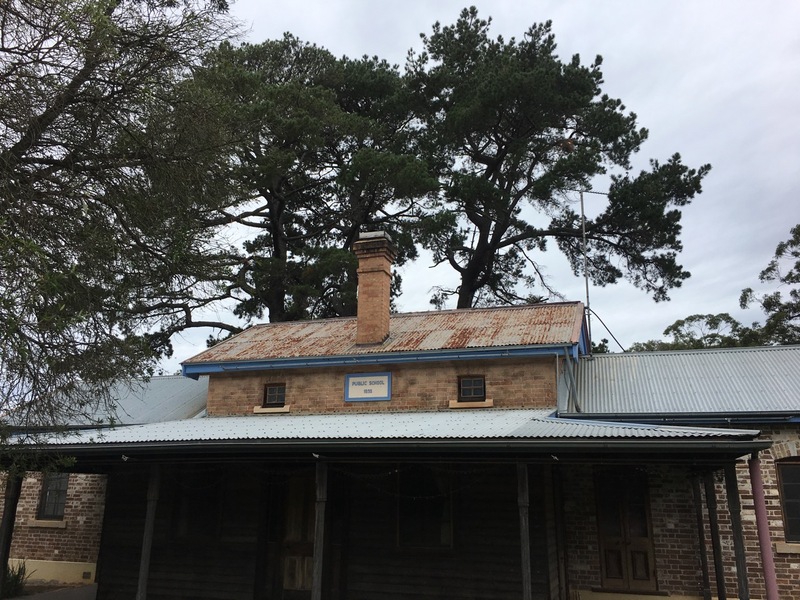 A hundred years ago, corrugated iron roofing could only be manufactured in short lengths, as it was rotary folded across the sheets to make the corrugations. This meant that to cover a long-span, a number of shorter sheets needed to be used and this required overlapping to stop leaks. All old iron roofs suffer from this same problem of rusting out on the overlaps. We are lucky to have a roof that has survived for so long without too much trouble. We live in quite a relatively dry environment with about 500mm of rain each year. I worked across the roof systematically siliconing every split, crack and thin rusty patch. The overlaps needed special attention. In one place I had to cut a small piece of rustic, but structurally very sound, old roofing iron into a small square. I glued this patch over the worst section, that was too big to close with just silicon alone. The big issue turned out to be the ridge capping. This is 130 year old lead! I wanted to replace it 35 years ago, when I was much younger, able-bodied and building the extensions on to the Old School Classroom. I didn’t want any lead on my roof. Unfortunately I struck one massive problem that stopped me in my tracks. The old lead was about 600 mm wide and the old wooden roofing battons were well spaced accordingly. Modern galvanised ridge capping is only about 460mm wide. Not wide enough to reach the old battons. This meant removing all the old sheets of iron and screwing on new battons, then replacing the roofing, then screwing down the new narrow ridge capping. A massive job. Not one that I could complete easily in a day. Being basically lazy, I decided that I had enough to do with building the new extensions onto the Old School classroom to make it into a house, so I left the old flashing up there. It was just easier to ignore it and hope for the best. The old lead capping has developed cracks and splits here and there along its length over the years. I siliconed these splits and cracks 30 years ago, and 20 years ago and then 10 years ago, Now the cracks are just too big and too long for silicon. Now my lead flashing chickens are coming home to roost. I will need to re-roof the whole school roof eventually. I hope that I can make it last long enough, so that it isn’t my job to do. I couldn’t do it by myself now. I’d need to employ someone to help me these days. My creative solution was to lift the old lead flashing and slide in new sections of shiny galvanised ridge capping in underneath the old lead. Then I screwed the old lead down over the new galvanised ridge capping, through into the old galvanised roofing. A cunning plan! From a distance, no-one can tell that I did anything at all. It looks exactly as it did before I fixed it, and that’s the way I like it. We are harvesting the last of the grape harvest. It’s been a long vintage this year, stretching over 8 weeks. We have been making dark grape juice out of most of the vintage. However, with these last few baskets full of rich dark red sugary deliciousness, we decide to make ‘Summer Wine’. We first came across this wonderful stuff in France, then Germany, followed by Switzerland and finally in northern Italy. As the season developed and the grapes ripened. We had to have the experience introduced to us by our hosts in Germany at that time. We stopped the car on the side of the road to buy vegetables and fruit from a farmers road-side stall. Our friend asked if we had tried ‘Niue Wine’ or ‘summer wine’? We hadn’t, so we did and it was a bit of a revelation. We have been making our version of concentrated red grape juice for a few decades and always look forward to it. We manage to bottle 20 or so litres each year for us throughout the year. We pasteurise it so that it will keep and not ferment. Then sealed in sterilised glass bottles. It works well. But this was an eye opener. We don’t make wine from our red grapes, because it is too much work for the reward. Good quality wine is cheap in Australia, why bother, but good organic red grape juice is extremely expensive. So thesis where we put our effort. What we experienced in Europe that autumn was just like our red grape juice, but very slightly fermented, possibly for just a few days. The outcome was a sweet grape juice with all the fruit flavour, but also enhanced with a little sourness and tingley, cabin dioxide induced spritzig. I might hazard a guess that it was fermented to about 2% or so of alcohol. It was a light, really refreshing and satisfying draft. We have since started to make a small batch of summer wine each year. It has to be drunk within a few days of the fermentation starting, while it still has plenty of sugars left in solution. We asked about the roadside wines that we saw and were told that it will only be available for a few days from each stall. Once the barrel is emptied, then that’s it. find the next farmer’s stall. They might possibly use the wild natural yeast bloom on the grape skins, but this can be very variable. Because we don’t know what we art doing, and don’t have parents and grandparents on hand with generations of local knowledge about such home based, home-grown, organic production. We decide to pastures the juice as usual and then add a known wine makers yeast to get a more-or-less predictable and reliable outcome. We wash and de-stem the grapes to make the juicing process easier. Either way it is a lot of work. This is just the way that we have got used to doing it over the years. After sterilizing by briefly simmering the juice, we let it cool over night and then add the yeast. , somewhere between 16 and 24 degrees C. We let it sit for a day to allow the ferment to get going and then bottle it. We start to drink it from the 2nd day. After the third day, or when we feel it has reached a good point in the sugar/acid balance, we bottle it and keep it in the fridge to stall any further fermentation. it keeps for a week like this. and then it all gone. If you try this at home, don’t screw the caps on. LEAVE THEM LOOSE.